If you have the space to accommodate one, a weeping willow makes a beautiful addition to your property. This is a guide about growing a weeping willow tree. About 45 years ago, probably in 1967, when we were living in Oak Ridge, Tennessee, my eldest son won an art contest at school with a painting of a gorgeous weeping willow in the yard across the street from us. The following summer in July on a very hot day, there was a dreadful electrical storm. The willow was split down the middle. I joined the neighbors in a crying fest and then asked for some cuttings. I was told by all the neighbors I couldn't plant in the middle of the summer. I was bound to try. I am a very stubborn person and not willing to give up on most things. Now you have to understand about the soil in Oak Ridge. It is awful! There is a problem with huge rocks about a shovel's depth underneath the surface. These must be dug out before any sort of planting can take place. When I found a place for my tree, I was met with a "boulder" about 14 inches long and probably that big around. It took at least 45 minutes to dig that rascal out leaving a perfect "bowl" to hold all the water I was planning to give Mr. Willow. I stripped all the leaves off some of the branches and put them in there along with some other goodies, like potting soil and such and planted my tree. It got a good watering every day and started to flourish. I must add that while I was planting the tree, all my neighbors were standing about laughing at me. At least two of them had degrees in horticulture. Several years later as willows are wont to do, he started causing trouble in the pipes. The owner/manager of our apartment complex told the maintenance crew to snake out those pipes every day if need be, but "do not" touch that woman's willow tree. We left Oak Ridge in 1977 and the tree was still alive and taller than the 2 story building. Eventually the building was sold and torn down and the tree had to be removed for a business complex of some sort. I suppose what I want to say is if you really want something to grow, and take very good care of it, you can plant it any time and expect it to flourish. Tip: What Size Pot Does My Weeping Willow Need? I have a weeping willow tree that is about 1 foot tall right now and I want to know how long I can leave it in a pot and what size pot it needs. It currently is in a 1 gallon nursery pot. I would appreciate advice. Unless you plan on keeping your willow as a container tree for a few years, I wouldn't put off transplanting it in the ground for too long. A 1 gallon container is small for the fast growing roots of a weeping willow. You can move it into a larger container for now if you plan on keeping it as a balcony or patio container for another 2 to 3 years, but otherwise it's best to transplant in the ground as soon as possible. When sizing up in containers, it's generally accepted that a vertical growing plant needs transplanting when it reaches twice the height of the container it's growing in. If you plan to keep on potting up, keep in mind that you risk loosing your tree from transplant shock every time you move it to a new pot. If you transplant it into the ground, it only has to suffer through this shock once. Of course, with the proper root pruning (like in bonsai trees), even large trees can last for many years in smaller containers. Root pruning is pretty labor intensive, however, especially as trees grow larger. If left in a small container too long, your tree will eventually start showing signs of being pot bound. Then even with the proper light, water and fertilization the leaves will be small and it will show a general loss of vigor. I have wanted a weeping willow tree all of my life, I am now 51. I have tried looking up various types so I know what they will look like when they grow, but am still not sure. In my area, they are selling cherry (white and pink), and "regular" and golden globe. I want one that is not real expensive and doesn't get too big. Where can I find accurate pictures of the different types of weeping willow trees? I wonder if I should abandon the idea since we live in an urban area? I do, however, have a wetter back yard, which is away from streets and buildings. Thanks. I have a mini tree called a Mayten tree. It weeps like a weeping willow but stays about 10 tall. I trim the bottom like I do my weeping willow. It fits nicely in my rock garden. It was recommended by the nursery woman who designed my flower gardens. Another good thing about it is it doesn't drip sticky stuff like the weeping willow. It flows with the breeze, which I love. Be careful of globe willows, they don't handle the wind well. We had all three of ours break off. Look to see what garden centers you have in the Evansville area. They usually carry the trees and plants that will thrive in your zone. Also, go to some of the bigger gardening websites I(i.e. Burpee, Victory Garden (PBS) to get an idea of what kind of willow you are looking for. There are willows like weeping cherry and then you have your standard weeping willow (with the long wisps of branches that sway in the breezes (and the kind they make willow furniture out of). Be careful...their roots go so deep and can get into your plumbing. Ours did that all the time. We were always calling roto-rooter to cut them out! They are beautiful though! 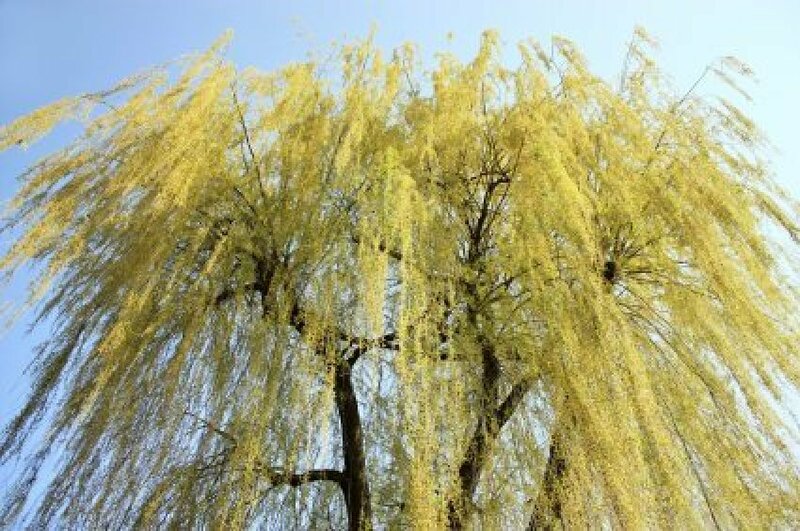 Search for "pictures of a weeping willow tree"lot of pictures & info there, good luck. Just be sure to not plant your tree over or near your septic tank or drain field if you have one. I think I'd consider a wheeping cherry tree instead. Theyre smaller and get flowers in the springtime. http://www.ces.  .edu/index.shtml is the website you should go to. It is the Purdue Indiana University which is your state extension service. Click on the ag and natural resource link at the top. This will tell you about the trees that grow in your area, problems, and suggestions. I always go to the county/state extension links when searching problems. Best EXPERT to consult! How far away should I plant a weeping willow from my sewer line? I live in the city. A lot of people won't plant any kind of tree close to sewer lines or foundations of buildings, etc., because the roots can raise cane with that kind of things, they can crack the foundations and I have a sister who has a lot of trouble with her sewer, because many years before she ever bought her house somebody had planted a tree close to the sewer lines running to house. Very far. The roots seek out water and will get into septic systems and other watering places. I'd pick another tree if I were you. Good luck! You really DON'T want a weeping willow in your yard. Some years ago, when mine got into the sewer line and the septic tank, I called Roto Rooter to clear it. $200 later, I asked how long their work was guaranteed. They told me, "with weeping willow, 6 weeks. Anything else, 6-12 months." A weeping cherry would be quite lovely... Grows slowly, lovely weeping branches; beautiful spring blossoms, few pests, no mess. Question: Will Weeping Willow Come Back? I bought a weeping willow 2 years ago from Walmart and it didn't seem to be growing much. Then last year we had our usual drought, and it seem to burn up. So my question is, will it come back to life? Or is it dead? I've cut back all the dead branches and I see no green on any bark. It's about 2 ft tall now. It's early March here so I'm hoping it's not warm enough yet. Thank you. You may have killed it by cutting the branches back. Ours goes dormant during drought and the winter. Then, in the spring those branches which seemed dead, come back to life. Willows have an extensive root system, so they generally come back. But, with it cut back as it is, I am not sure that will come back. Willow trees bloom in April and May. 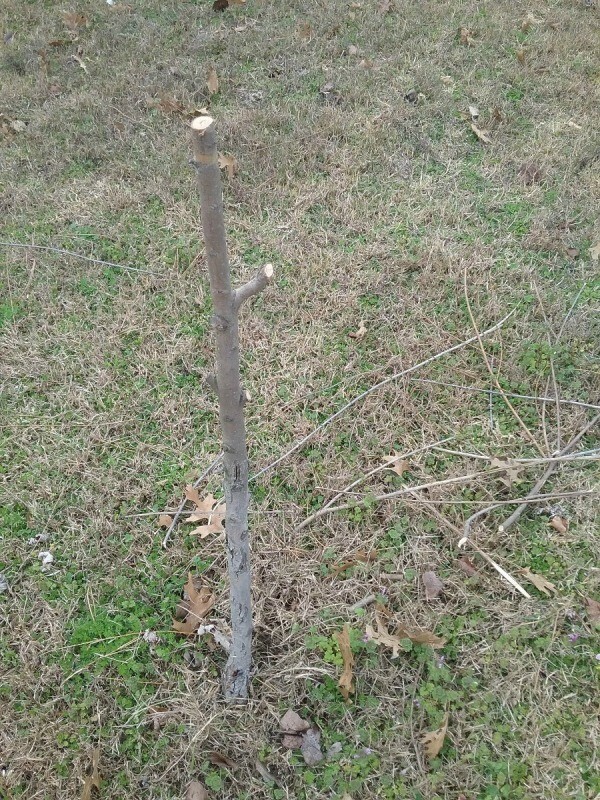 You can prune a young tree. It is best to prune in winter and to remove dead branches only. You can also give your tree some fertilizer. The tree needs water, and if it is dead, that may be what killed it. My willow tree died, but sprouted from the bottom. Will I her a tree or just a bush? Thanks. Another tree. You can easily root willow branches to start new trees. What kind of food can I provide my trees to ensure they are healthy. My trees are 7 years old. Miracle grow makes tree stakes. Read on the packaging, as different spikes are made for different trees. You put them in the ground about a foot away from the tree. They like alkaline soil, so get fertilizer for that. Question: Where Can I Plant a Weeping Willow? I am interested in planting a weeping willow near a saltwater bulkhead. As it matures could it break the bulkhead? The bulkhead is old and has some cracks in it. I don't know what a bulkhead is, but I remember as a child my Mom the Gardener said never to plant them by a septic tank; the branches under the tree seek a water source and will clog your septic tank. Sorry, wish I had more to offer. Good luck! 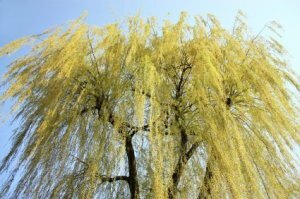 What is the best time of year to plant a weeping willow? Never! Actually, it depends on where you live as to whether you plant in Spring or Fall. Do not plant in hot season and this tree is a water hog. Do NOT plant near a septic tank or water line as the roots will grow to the wet area and invade the pipes. I have a huge weeping willow that is near my house and it is a messy tree. This tree does best next to a pond or by the water. I am relandscaping a waterfront property. There is a large weeping willow that needs to be removed because the trunk is hollow from about the midpoint down to the roots. If I remove the tree and stump, can I plant a new willow in the same spot right away? This spring I planted a weeping willow. It was doing great until a few weeks ago. It started to get black spot on most of the leaves. We removed all the limbs. Will it come back OK and what is this? Thought tree lovers might like to see my enormous willow tree. Photos really don't do it justice. Standing beside it, however, is a truly humbling experience, imagining all the years and history it has seen, the storms it has withstood, the children that have climbed and built forts in it. Are there any tree experts out there that could hazard a guess of its age? I have no idea. How far from my house should I plant a weeping willow tree? Archive: Where Can I Plant A Weeping Willow? I decided I wanted a weeping willow and so we planted one in the front yard about 20 ft from the house and 15 feet from the street, but now I am worried about the septic system and foundation. I keep reading that they should not be planted near any septic or water lines (our septic is in the backyard). I want to know what a safe distance is to plant a willow from septic or water lines? Could anyone help me with this? 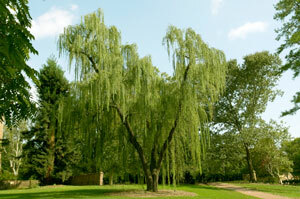 Willow trees are fast growing, graceful, and dramatic, which is why they tend to be popular choices among homeowners. Unfortunately, their growing habits are not very well suited to an urban landscape. The answer to your question on a safe planting distance depends on how far away the roots need to grow to access water. Weeping willows are water lovers, and therefore their roots are experts at seeking out reservoirs of water. This tree actually likes to stand in water, which is why in the wild, they are commonly found growing along the banks of rivers and streams, and near wetlands. Weeping willows grow to a height of 35 to 50 feet, but their roots are capable of venturing out much farther than the spread of their branches in order to find water. 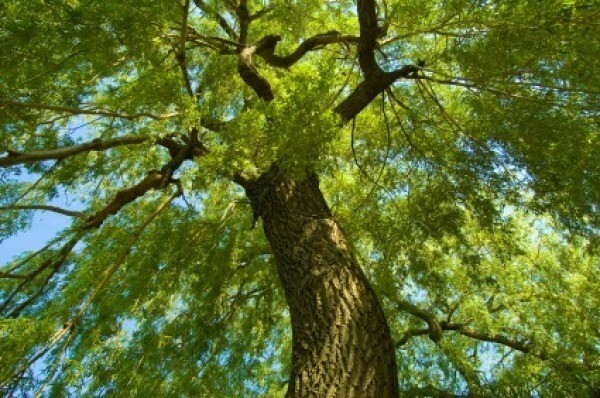 Most tree experts (and I am not a tree expert) agree that trees known for roots that seek out water, such as poplar, maple, willow, and elm, should be planted at least 50 feet from septic mounds. To confirm this, I checked with my county extension agency and they agreed with that recommendation. From your description, it sounds as though your weeping willow is separated from your septic tank and drain field by your house. That is a good thing. A bigger concern for you is your foundation, and where in relation to the location of your tree, your water and sewer pipes enter and exit your home. The nutrient-rich water from leaky sewer pipes or cracked water lines can act like a magnet for wandering roots. On the bright side, as long as the roots have enough room to spread out, a solid structure like your foundation should divert the direction of their growth, providing that that nearby water or sewer pipes are in good repair, and you don't have problems with moisture pooling around your foundation. Help keep the tree's roots away from your foundation by keeping water away from it. Build up the soil around your foundation so that it slopes away from your house, and use rain gutters to divert the flow of water away from your foundation. Where Can I Plant A Weeping Willow? Its not good to plant any type of tree near your septic tank. The roots grow up into the pipes that make up the drain field. I know where my drain field for the septic tank is located because I build the house and was here when it was installed. We made the mistake of planting poplar trees along the front of our property and roots grew into the drainfield's pipes. I have to wait for them to rot. (sigh) So I am saying that you should not only consider the septic tank, but the septic tank's drain field as well. Overall, I suggest you read about the variety of tree you want to plant to find out how tall and wide it will be when it reaches maturity. I think you can pretty much tell how far the roots will reach by using the outermost tips of the branches as a guide. I think the tree extends underground about as far as it does above ground. So if your tree grows to be 20' tall and 20' wide, you can plan on the roots to extend that far as well. Trees are good and I've read they add 10 % to the value of your property (your house). They protect the house from winds and help save on heating and air conditioning. So when you plant a tree you will also want to consider what directions storms come where you live. Where I live the storms always come from the West. (That is the side of the house where rain will come in windows if they are left open.) So that is the side of the house where I need to have trees planted.